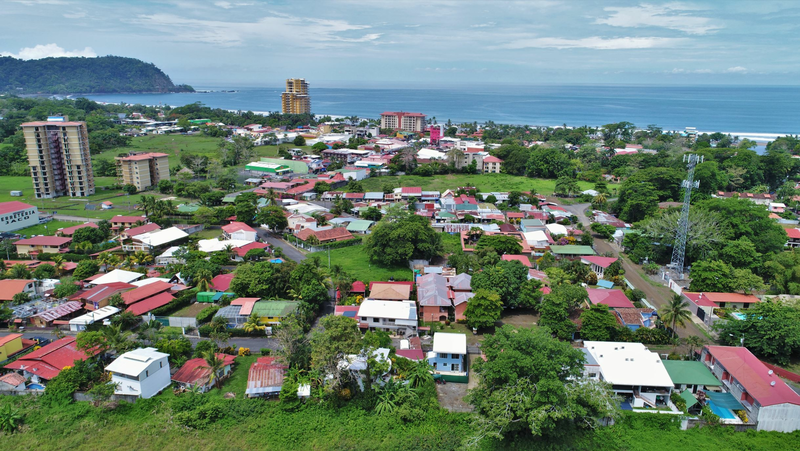 The Palms Properties for Sale in Jaco Beach, Costa Rica! The Palms is located at the north end of Jaco Beach in Costa Rica and is a gated beach front condominium development. From the condos that are both for sale and for rent you have panoramic Pacific Ocean views. The Palms towers 10 floors high and has spacious 2 bedroom and 3 bedroom condos with luxurious bathrooms. The units have modern architecture with high end finishes such as granite countertops and stainless steel appliances. The condos have a spacious kitchen and living with modern furniture. The condos have balconies from where you can enjoy an ocean view and the amazing sunsets. The Palms has a beachfront pool with direct access to the beach. The north end of the beach of Jaco is a bit quieter and is a good location to relax. The Palms has 24 hour security, secure parking and a property management company with rental possibilities. Residents have access to the facilities of the next door Croc’s Resort. Here you find an enormous pool with a separate kids area and restaurants, shops and a casino. The Palms is near all the varied attractions of Jaco. You can walk to Jaco center or take a taxi which will be a short ride. You will find supermarkets, banks, shops, medical services and spas in the town of Jaco. Jaco has many different style restaurants and bars. Jaco has also a great nightlife! There are many activities and tours in Jaco and surrounded area. The following are very popular; surfing, zip lining, horseback riding, ATV tours, hiking, sport fishing and golfing. The property is thanks to the new highway an easy 80 minute drive from the international airport of Costa Rica. The Palms has the perfect setting for your Costa Rica vacation home. REMAX has several condo units for sale at The Palms.